-The natural ingredients in Hevert Cold & Flu Relief support the body’s self-healing power. -Take it at the first symptoms of a cold such as abnormal fatigue, chills, runny or stuffy nose or fever. This can prevent the cold from getting worse and spreading to the bronchi or sinuses. -Cold and flu symptoms such as runny nose, sneezing, sore throat, fever and body aches are relieved. -Hevert Cold & Flu Relief does not cause drowsiness, making it suitable for drivers and those who must always be able to concentrate for work. -This homeopathic medicine can also be taken along with conventional medicines. -Hevert Cold & Flu Relief is easy to use. The tablets are quick dissolving in mouth. 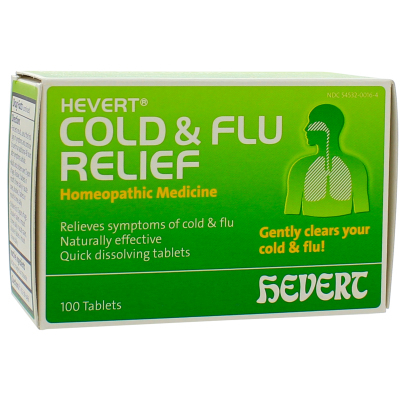 Hevert Cold & Flu Relief – For the temporary relief of cold and flu symptoms.